It is worth looking closely at how puppets are organised in a specific geographical ecosystem, as in Catalonia. A territory with about seven and a half million inhabitants and an area of 32,106.5 km², it is composed of four provinces with their corresponding capitals: Barcelona, ​​Tarragona, Lleida and Girona. A region, a country or a territory, it is one of the Autonomous Communities of the Kingdom of Spain; it has a language of its own,Catalan, and a continuing historical tendency defending self-government, or even the maximum autonomy of independence. A region which has traditionally enjoyed great entrepreneurial dynamism given its important network of cities, each having great individual personality and many of which were important manufacturing and industrial centres. This network has, in truth, been functioning as such since the end of the Lower Middle Ages, with Barcelona as a shopfront, and a centre of commerce and distribution. This reality has been accentuated by the success of Barcelona since the Olympic Games and its urban transformation, converting the city into a shop window that attracts millions of tourist year-round, for good and ill. All this means that Barcelona has become the undisputed driver of this urban network. It is a highly complex web of cities and the connection with the other Catalan towns is vital, but so, too, is the connection with other networks in the area: further south in Valencia – a similarly diverse region – and in the west with Aragon, where Zaragoza has become a first-class logistical centre, acting as a bridge between Madrid and Barcelona. 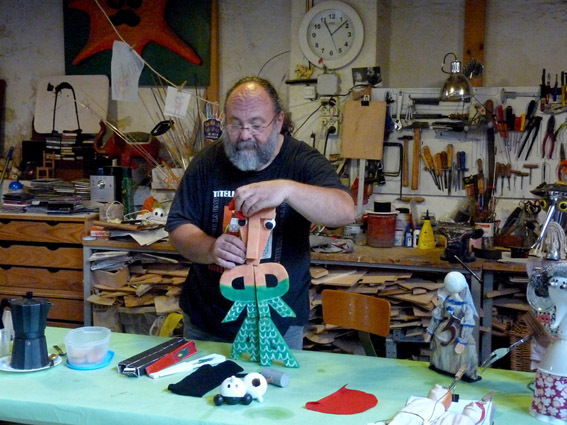 The artist, graphic designer and puppeteer, Javier Mariscal, with Cobi. Our focus, logically for this magazine, will be on the subject of puppetry, one of the region’s cultural activities which, modest though it is, is of great significance as an ever-growing factor of cultural dynamism, motivating, animating and bringing together many thousands of people and employing hundreds more. 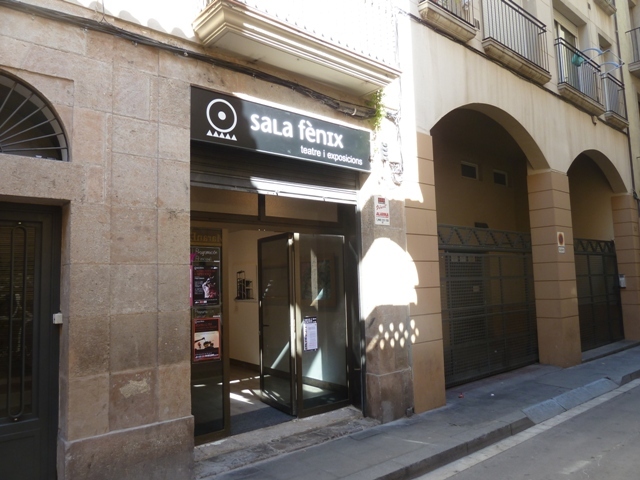 An activity not only pertaining to Catalonia but which has repercussions throughout the world, if we take into account that in this part of the Peninsular theatre is often produced more for export than for home consumption. We want to talk about the towns and villages which, over the years, have turned into important puppetry centres either because they host a festival, a theatre or one (or more) companies with a recognised trajectory. However, to start with, we will look at Barcelona, whose complexity will occupy the first part of this study. 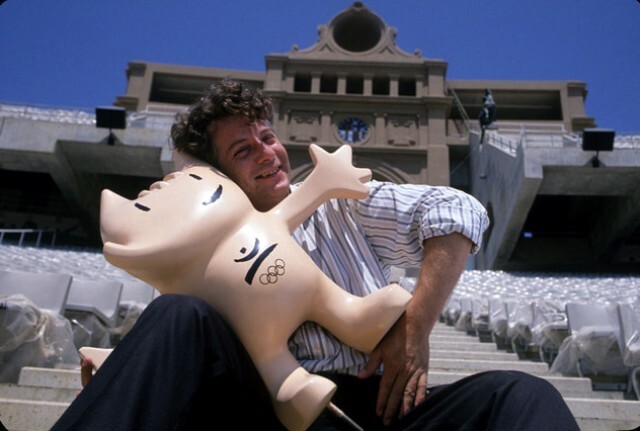 It is interesting to consider Barcelona’s development curve in terms of puppetry, which was high in the 1970s, fell in the 1990s and has once more risen in the twenty-first century. A trajectory that is correct but, at the same time, deceptive given that, as will be seen, the sector has never ceased to grow and consolidate itself since the 1960s..
Poster of the Barcelona Puppet Festival of 1994. Indeed, Barcelona was the undisputed puppet capital of the Iberian Peninsula during the period known as the Transition, after the dictator Francisco Franco’s death, up until the 1990s, thanks in part to its important International Festival, created in 1972 (the first in the country) by Joan Baixas and Hermann Bonín, then director of the Institut del Teatre. For many years the festival director was Josep Mª Carbonell. 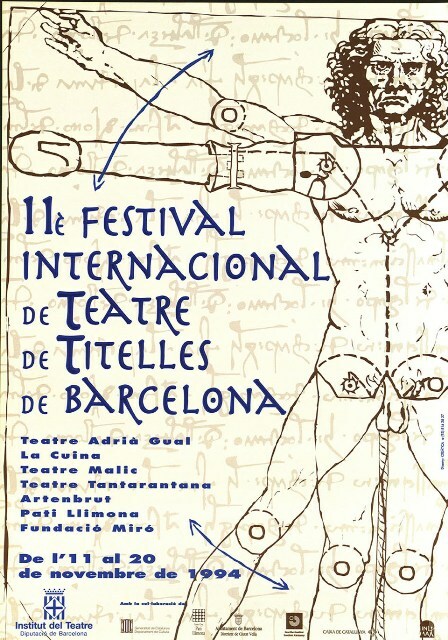 After his death, the successive directors were Joan Baixas, Víctor Molina and Jordi Fontdevila, until a change of name and the strategic interests of the Institut del Teatre – organisers of the festival – led to the festival’s disappearance. The evolution of the Puppet Festival occurred hand-in-hand with the general health of the sector, especially in terms of puppets of a more traditional nature. Yet, nevertheless, since that energetic and lively period of the 1970s, the sector has grown, extending its boundaries up to today’s situation in which companies in Catalonia involved in visual, object, mechanical and puppet theatre are at a high point, in an exceptional position, even, when considered in terms of the national and European field. Below, we look at the current situation of puppetry (festivals, theatres, schools, workshops, companies and so on) that gives a particular quality to Barcelona. 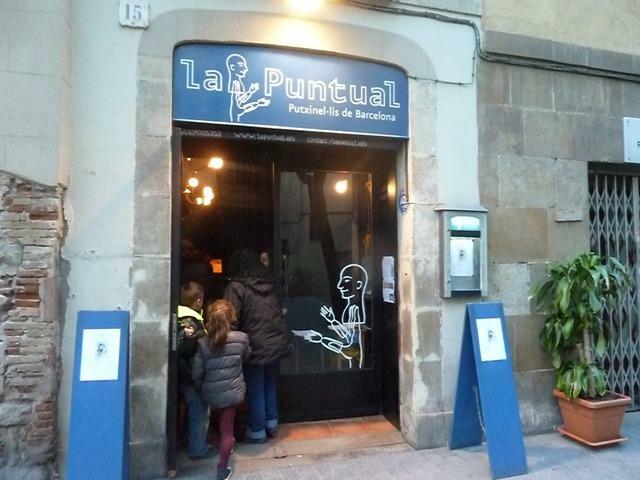 Inventory of initiatives, activities and puppet venues in Barcelona. We have to begin this section by mentioning the Fiestas de la Mercè, Barcelona’s festival celebrating its patron, which takes place around 24th September (see here). To the surprise of all, puppeteers included, la Mercè has, especially under its current director, choreographer Marta Almirall, become one of the most important festivals in the whole country as far as puppetry is concerned. During the festival, the Ciutadella Park is entirely dedicated to visual theatre, mechanical and puppet theatre, hosting all possible genres; while puppets are present, also, in many other parts of the city. Of obligatory reference, is the huge street procession of dragons and fire-breathing beasts, known as the Correfoc. Similarly, Món Llibre, organised by the City council before the feast of Sant Jordi (in April) at the CCCB (Centro de Cultura Contemporánea de Barcelona) and also directed by Marta Almirall, is a small festival with a strong presence of puppet and visual theatre performances. Contact: malmirall@bcn.cat. Likewise, the Festival Grec held in July, the most important of the city’s arts festivals, increasingly includes puppetry and visual theatre. Their presence has been particularly important during the period of the directorship of Ramon Simó, as was also true under Xavier Albertí. One example is the opera of automated marionettes by Roland Olbeter (see here) presented in the recent 2016 edition. The Grec presents, on the other hand, a programme specifically for family audiences called ‘MiniGrec’ in which theatres such as La Puntual, Sala Fènix, Vilella Teatro, among others, participate with high quality shows. The Mercat de les Flors, a performance space dedicated to the world of dance, directed by Cesc Casadesús, has always been open to the cross fertilisation of physical and gestural languages. It is therefore not surprising to encounter shows combining dance and objects, one of the multiple variations today of object theatre. 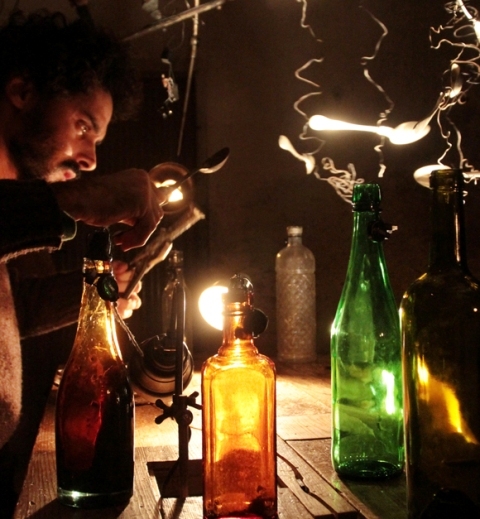 On the other hand, in December 2015, a cycle opened focusing on objects and visual theatre, commissioned by Jordi Fontdevila, ex-director of Neo. Entitled ‘Oh! Poètiques de la Il·lusió’ (see here), the cycle presented a magnificent programme. Contact: info@mercatflors.cat. Insomni, by Xavier Bobés. Festival ‘Oh! Poètiques de la Il·lusió’. Escena Poblenou is the name of the Festival of Contemporary Creative work (see here) that takes place in the very active Centre Cívic Can Felipa as well as in other venues and on the streets of the neighbourhood of Poblenou. 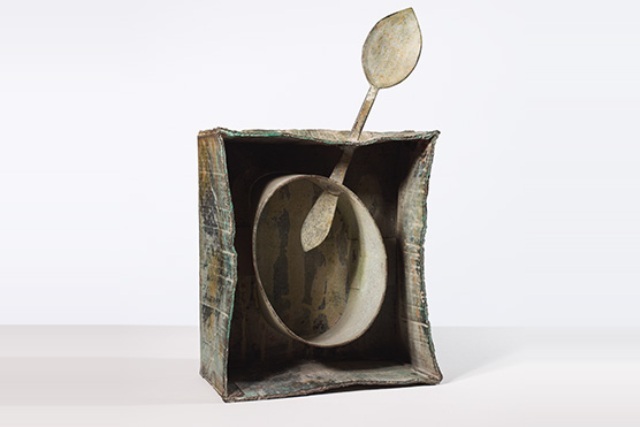 Its programme includes numerous visual, shadow and object theatre shows, always committed to contemporary creative work. Each year is dedicated to a specific theme, that of 2016 being Heroism. This festival was awarded the Medal of Honour of the City of Barcelona in 2015 and the FAD Sebatià Gasch Prize in 2014. With a first edition in 2001 under the impulse and guidance of the artists Ada Vilaró and Sergi Estebanell, the intention is to generate a creative and performance platform for different contemporary performance genres and, at the same time, to strengthen the artistic network related to the neighbourhood of Poblenou and the city itself from an international perspective. Contacto: info@escenapoblenou.com. Photograph by Jesús Atienza, exhibition ‘Territoris íntims’, Ròmbic festival, Ateneu 9 Barris. 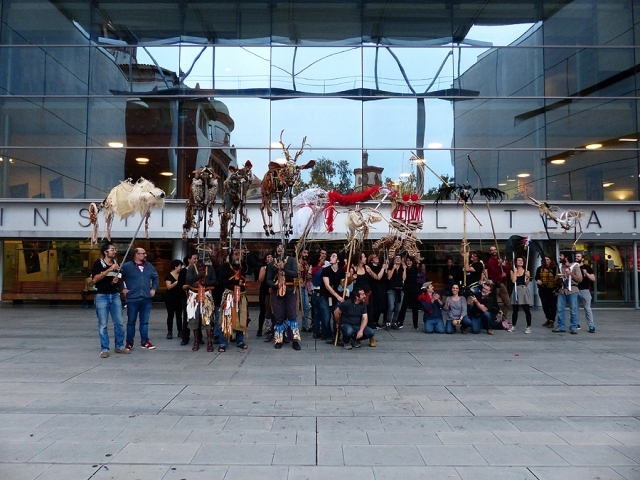 With the exhibition Figures of Doubleness (see here), held at Arts Santa Mònica in 2015 by the association Interseccions with the collaboration of the Barcelona Theatre Institute (Institut del Teatre), a festival was also created, IF Barcelona – Puppets, machines and Strings, with the aim of becoming the successor to the original International Puppet Festival (see here). The magazine Puppetring (Titeresante in Spanish, Putxinel·li in Catalan) actively participated in the realisation of this festival. Organised by the Asociació Interseccions and the result of an idea by Toni Rumbau, its programming, commissioning, production, and content-generating team comprises Jordi Alomar, Giulia Poltronieri and Cesc Martínez. For the moment IF alternates between even and odd years. The even years (as in this, 2016) are dedicated to organising residences for new projects and to encouraging the creation of new work, besides specialised courses and the symposium. The odd years (2017, 2019…) focus more on the performance of local and international shows; the criteria, here, is for a transversal vision of the genre, seeking a crossover of languages and techniques, without forgetting the important puppet traditions of the world. La Plaza. Picasso figures by Jordi Joan Guillén. Photo by Román Yñán. Arts Santa Mònica. Exhibition Figures of Doubleness. Entrance to the theatre La Puntual. 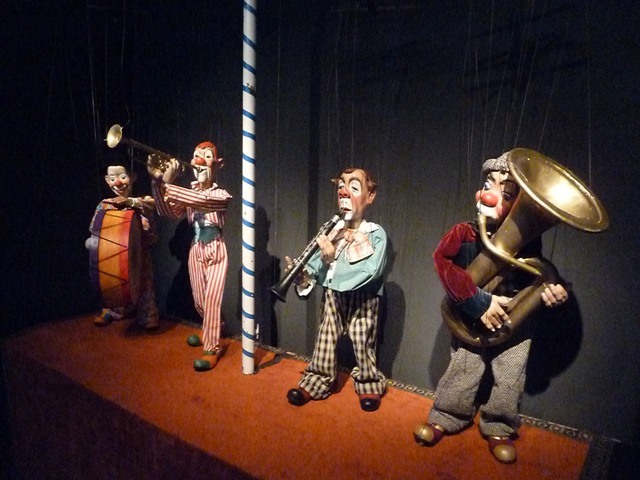 Marionettes of the Marionetarium Herta Frankel. Exhibition Figures of Doubleness. 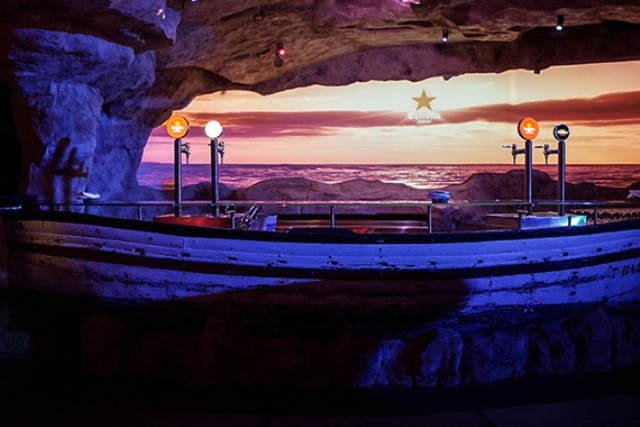 However, as often happens with cities of a certain size, Barcelona is well-stocked with theatres that are not necessarily specialised, in which puppet shows are given, sometimes for adults and, at others, at the weekends or as part of seasons for schools, for younger audiences. Sculptural object by Joan Miró. Exhibition Miró and the Object. 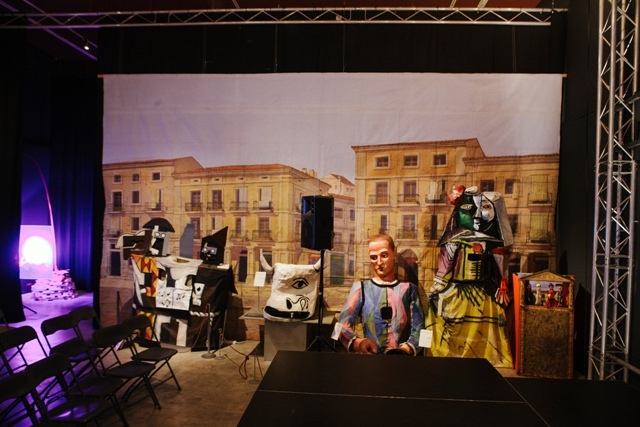 The maturity of the puppet sector in Barcelona — the outcome of the years of professional work by many veteran companies — manifests itself ultimately by the presence and importance of many studios; their tendency is to open to the outside, to encourage meetings between puppeteers and to organise interdisciplinary projects, in which not only the ‘home’ members participate but also other individuals. 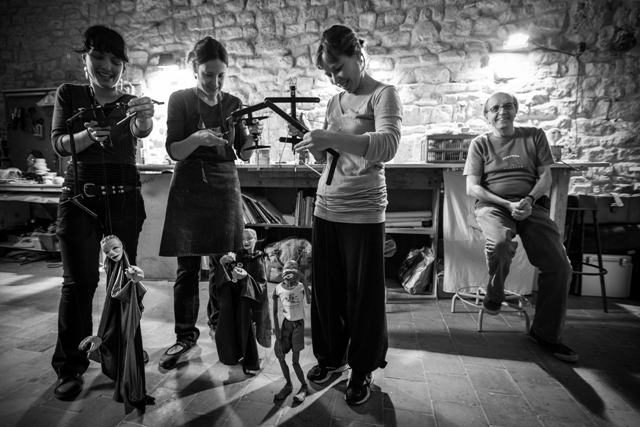 Stage of the Casa-Taller de Marionetas de Pepe Otal. Homage to Lope de Alberdi. Photo by Raquel Batet. Participants of the course run by Iker Vicente outside the Institut del Teatre, where the workshop was held. Photo by Jesús Atienza. Taller del Parc, Jordi Bertran. David Laín in his studio. Photo by Jesús Atienza. The Marionetarium del Tibidabo (see here) is another obligatory stop, also converted into a school thanks to its workshops, from which numerous professional puppeteers working today have emerged. The privileged position of the site is also an attraction, at the top of the Tibidabo hill, giving one of the best views of the city. Contact:marionetarium@gmail.com. 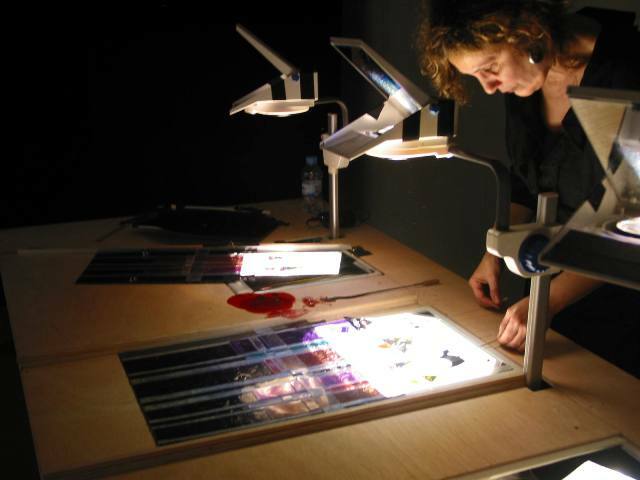 Mercè Framis working in her studio. Rene Baker at La Mona de Seda. This on-the-ground situation of studios not only enhances the social dynamic of the puppeteering human network but, also, makes up for the lack of a specialised school in Barcelona in a broad institutional sense, apart from the previously mentioned Institut del Teatre (see here), of a wider and more general training as far as visual and object theatre is concerned. The explosion of studios is symptomatic of the current euphoric period of puppetry in the city, which means you can walk down the Ramblas and suddenly come face to face with a well-known veteran puppeteer from the other side of the planet, attracted by the fame of Barcelona; a city that has become one of those destinations that any mortal must visit if only once in a lifetime, some drawn by the architecture of Gaudí, others by Barça Football Club, and a few more by the state of its puppetry. Eager to do away with the scepticism of the puppeteers themselves in this regard, the puppets — aware of the phenomenon — have pushed their human servants to ascend the wave and experience, too, the Barcelona Moment. The street, bars and other, unclassifiable, localities. Barcelona has been a city with a very important presence of puppeteers and, above all, string puppeteers as street performers. 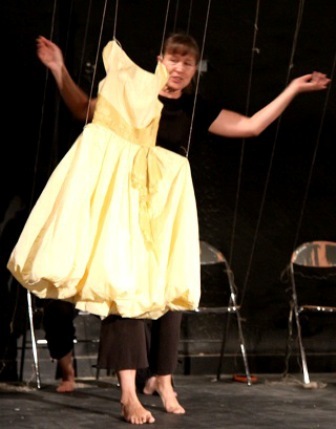 (see here about string puppetry in Barcelona). Following the puppeteers and companies that began performing on the street in the 1970s and ’80s, (La Fanfarra, Pepe Otal, Col·lectiu d’Animació now Rocamora Teatre, Luis Fellini, Farsants, Jordi Bertran, Santi Arnal, La Fura dels Baus, David Laín, Pep Gómez, among many others), the city’s pavements and squares have hosted many puppet artists of string, glove and other techniques. Puppeteers such as the Mexican Daniel Loeza, whose remarkable frog has been a regular presence (previously on the Ramblas, and now on the Paseo Lluís Companys), or the many string puppeteers of the Casa-Taller de Marionetas de Pepe Otal, are currently those most often seen on the street. What a shame that the City Council’s by-laws are creating so many problems for these artists, something that sooner or later will need to be improved. 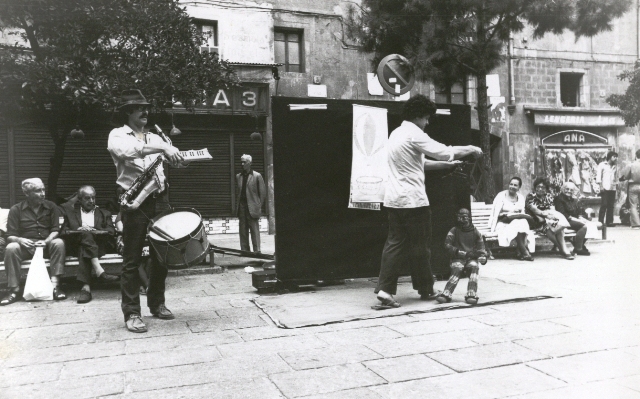 The Fanfarra performing in the Plaça del Pi, in 1977. Photo Costa. There are many bars, especially those directed at nocturnal and informal audiences (bares, neighbourhood centres, cultural associations, art centres, galleries, squats…), that also offer occasional stages for puppet shows. Names such as Pep Gómez, Pepe Otal, Mina Trapp, Andrea Lorenzetti, Valentina Raposo, Shaday Larios, Marga Carbonell, Miren Larrea and Paulette San Martín, to mention only a few, have often performed in bars and other undefined spaces. The neighbourhoods of Gracia, the Raval, Poble Nou, Poble Sec and Ciutat Vella have, in general, been the preferred ‘stamping grounds’ of these artists of the night. We should mention that the most important theatres in Barcelona –Teatre Nacional (see here), Teatre Lliure (see here), and the Gran Teatre del Liceu itself (see here) have, of late, programmed puppets and visual theatre suitable for large stages (by Joan Baixas, Els Comediants, Etcétera de Granada, Per Poc, Cabo San Roque, Marcel·lí Antúnez, various opera and theatre productions from the directors of Fura dels Baus and others who emphasise the possibilities of imaginary stage worlds). It is a growing phenomenon that can be explained by the centrality and importance of visual, object and mechanical theatre at the heart of contemporary theatre. Image of Daurrodó, by Joan Baixas and Cildo Meireles, at the Teatre Nacional de Catalunya. The Exhibition Figures of Doubleness. It was this exuberance that encouraged Toni Rumbau and Anna Valls, director of MAE (Museu de les Arts Escèniques) of the Institut del Teatre (see here), to organise the large exhibition Puppets, Machines and Stringsheld at Arts Santa Mònica (from 8th October 2015 to 8th January 2016), entitled ‘Figures of Doubleness‘ (see here). An exhibition centring on the subject of otherness, complemented by a symposium as well as the festival IF Barcelona, established at that point, as previously mentioned. Automata by Ety Fefer, Exhibition Figures of Doubleness. 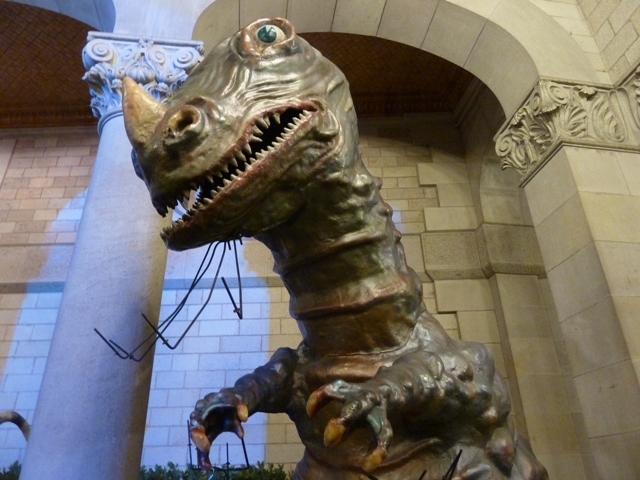 The exhibition showed the complex dimensions of this Puppet Period in Barcelona, with two itineraries that occupied both floors of Arts Santa Mònica: the first, dedicated to Seven Doors of Otherness (The Threshold, Animalia, Hells and Demons, The Battle, Death, Figures of Devotion, The Other), and the second to The Puppet Larder, with eight different sections (Sitting room puppetry, Hands, Strings, Machines, Shadows, Sheaf of arts, Opera, The square). As a peculiarity of this Barcelona Moment, we should mention the bar-restaurante, Òpera Samfaina (see here) that has recently opened in the basement of the Liceu, the city’s opera theatre, and which represents a veritable homage to the world of puppetry, especially the most festive and the street variety. Its creator, Franc Aleu, is a recognised artist in the city who, through his use of video, has been the driver behind many of the most important visual innovations of companies such as La Fura dels Baus and others. One of the bars of the Òpera Samfaina. Òpera Samfaina is a living, hedonistic celebration of the richness of visual theatre in Catalonia today. With its automata backdrops of beautiful technical complexity, combined with an almost kitsch appearance of traditional ingenuousness, and the different visual spaces which the client is invited to experience and enjoy, Òpera Samfaina is, perhaps, the venue in Barcelona where the most creativity, ingenuity, technological know-how and puppetry skills are united per square meter. A unique bar that, without fleeing tourism, goes beyond it and suggests the direction the city should take in search of its future: along the paths of creativity, art, uninhibited imagination, entrepreneurial commitment and hedonistic intelligence. This happy reality, undoubtedly exaggerated by the enthusiasm engendered by realising how positive the outlook is, also, inevitably, has its more sombre aspects; three at least must be mentioned: 1- the lack of an exhibition space for the Museum of Theatre Arts (MAE), with its important collections of puppets of so many of the country’s puppeteers, 2- the lack of a real, official school specialising in visual, mechanical, object and puppet theatre, capable of covering today’s broad demand, a school which should also possess its own multi-purpose performance spaces, and, 3- the lack of an international festival of similar size to the original puppet festival. 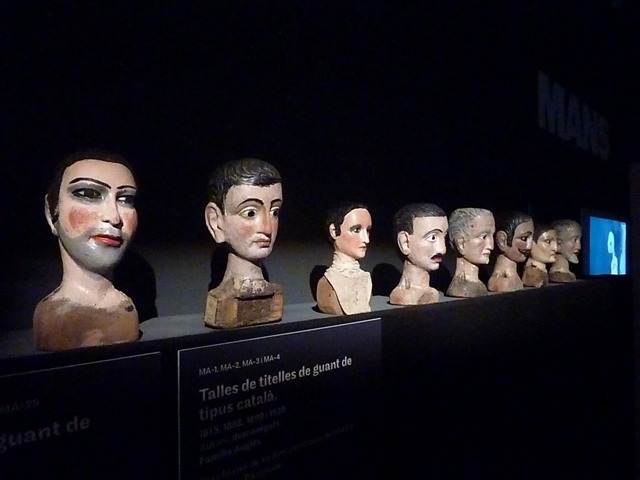 Heads of the traditional Catalan Puppet. Familia Anglès and Família Vergés. Collection of MAE. Exhibition Figures of Doubleness. 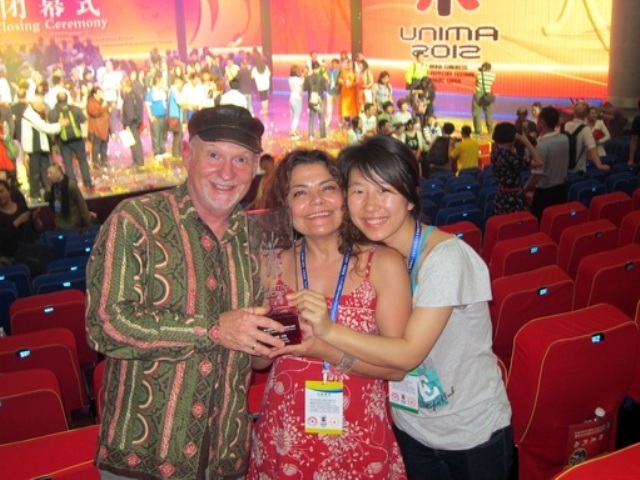 Three problems that, as can be seen, are closely linked to the Theatre Institute, an institution that has historically been closely related to the world of puppetry but, as it grew, has distanced itself from our sector with its near exclusive focus on the world of text and actors. 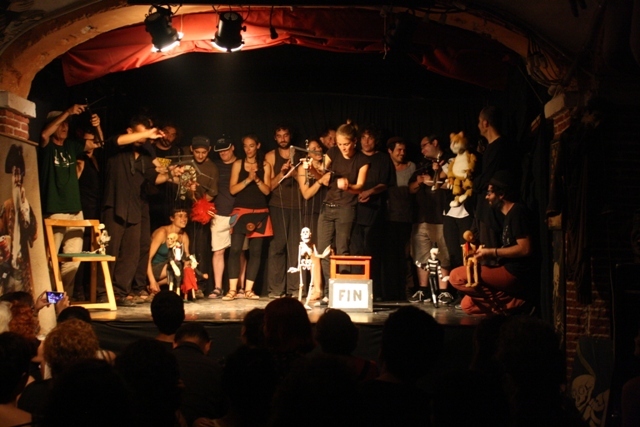 A situation that, looked at from another angle, demands a firm commitment to the profession and a broad awareness of the sector, capable of including traditionally made puppets, but also current forms of visual theatre, object theatre and mechanical theatre, powerful vectors driving towards the future of the puppet world. In upcoming chapters we will deal with other Puppetry cities of Catalonia. This article has been written and translated in collaboration with Unima Catalunya.